Recently, I have been playing with a Traffic model (basic) on Netlogo and thinking as to what we might learn from such a self organizing event in order to adapt and survive in a better way. In this post, I would like to explore whether the lessons of adaptation gained from this simple model can be applied to a broad base of applications covering different fields. A general screenshot of the game/model is given below. What I want to do is to show how the “RGBwaves” concept, the central theme of Nemetics (1), is applied to obtain deeper understanding of patterns of the events (Red Wave). Then I would like to examine the reason that drives such behavior (Green Wave). Having done that I would then like to explore the nature of the collective intelligence (Blue Wave) and how to change that for better adaptation in complex environments. Once done, we would then try to see whether the insights along with the wisdom this model (2) offers can be usefully applied to different fields of study in some practical manner. Along with this I would also explore what precisely needs to be changed or adapted. In short, we would like to explore enough to get to the bottom of things enabling effective adaptation. It might be useful to notice that the R (Red), G (Green) & B (Blue) waves are interconnected and interdependent, i.e. one affects the other. Hence a change of modulation or adaptation in any wave can bring about effective changes or results. However, deciding about which wave(s) to tweak and by how much (adaptation) to bring about long-term on-going collective benefits would of course depend on the nature and character of the situation we face. However, one need not be overwhelmed by the RGB waves and how to get around them. The whole concept of RGB waves is carefully embedded in the following NEME poster that starts with the observation of the R wave at the ‘Notice’ stage and gently leads us to the B wave at the ‘Exchange’ stage. We would then explore events through the NEME process (or the Nemetic process as it is called) as depicted below. In the Notice stage we actually observe the R wave – that is its ’emergence’, ‘movement’ and ‘shape’. In the Engage stage we observe the objects and the fields they create through their interconnections and interdependence. 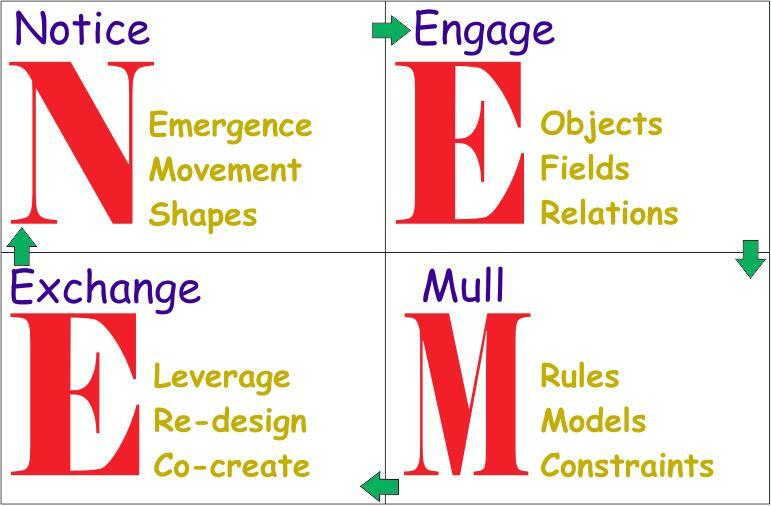 At the Mull stage we find the ‘rules’ that govern the behavior of the individual and the group. We understand the given constraints under which the whole system operates and then use models to explore through mathematical visualization different possibilities that emerge to help us get to the bottom of things. For this we look to the G wave. Finally, the Exchange stage surfaces our crucial concern for adaptation that is done through tweaks of different waves or modulation of the waves through the process of redesign, which is iterative in nature. This is done against authentic constraints by involving the stakeholders involved to co-create solutions. Usually the best solutions are obtained by leveraging the most crucial part of a phenomenon where care is taken to keep both effort and costs to the bare minimum. The idea is to effectively resolve a given paradox to obtain on-going benefits. This involves both exploration and exploitation of the B wave (collective intelligence). In case of our traffic jam problem the paradox is – the system always moves forward but the jam grows longer backwards. The same paradox can be extended to in the case of a developing economy — as an economy grows poverty grows too. In this case we are trying to notice ‘traffic jam’ as emergence. The movement that we are noticing is the flow of traffic along with its speed, acceleration, deceleration and the number of cars on the road. In terms of movement we also notice whether the movement approaches a fixed outcome (fixed attractor), or is the movement periodic (sync attractor) or quasi-periodic (a torus attractor) or something quite strange is happening (strange attractor). We also notice the shape, which in this case turns out to be a tube (3) containing the stretch of road (a highway), cars which are in some way coupled to one another through invisible strings. In this case we consider that this tube is not connected to other tubes operating in the same space and time. And the issue that we are about to observe is Spacio-Temporal in nature i.e. the event is playing out in both Space and Time, which makes things complex indeed calling for instant moment to moment adaptation. Let us start the exploration through modeling. 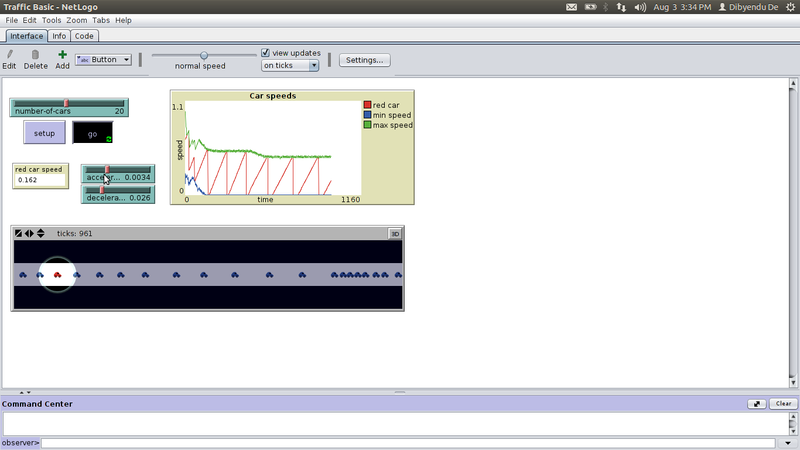 In this case we have a fixed number of cars running on the road against time. We can of course change the number of cars plying the road during the experiment to see whether that affects the outcome. Our car of interest is the red car. The rule is simple. If there is a clear stretch of road ahead we accelerate else we decelerate if the space between cars is insufficient to maintain speed. So, the driver takes the decision to either accelerate or decelerate depending on the situation. 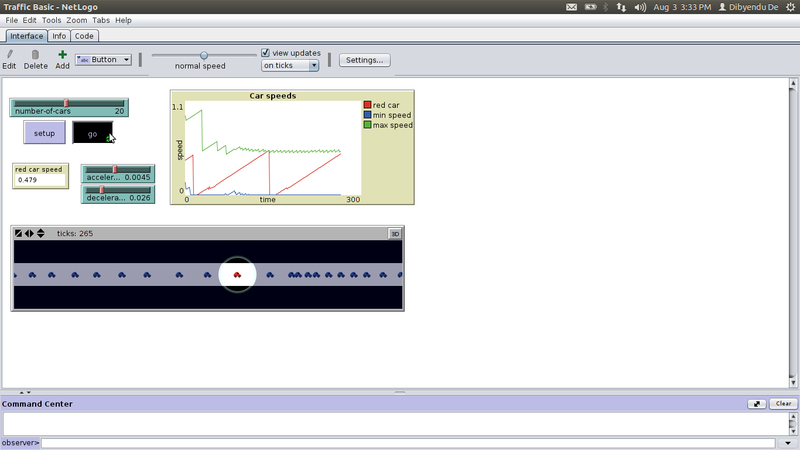 In this experiment the variables I have tuned are: a) acceleration b) deceleration c) number of cars on the road. Given below is a representative sample set of the outcomes that might be just enough for the critical insight to pop out of the dark. To go along with the experiment just think which of the above three factors (number of cars on the road, acceleration or deceleration) would cause a traffic jam or snarl. It can be more than one variable or parameter or a combination. Make a guess to start with. What causes or ‘uncauses’ Traffic Jams? I hope reflecting on these three representative samples (5) from the experiment (R waves) would help us see the underlying G (Green) and B (Blue) waves. 1. Clearly the pattern is that of a ‘saw tooth’ wave (represented by the red graph, which shows the velocity of the red car at various points of time). Seeing such a ‘saw tooth’ wave instantly points us to the ‘quasi-periodic’ nature of the movement of traffic flow. This is also the characteristic signature of a ‘Torus Attractor’ (4), which is commonly found in reality. In simple terms it means that system after some time dances around lock stepped with this attractor and that is what keeps producing the events (R Wave) in a quasi periodic manner. The dance is at times periodic and at times non-periodic. 2. The acceleration and deceleration, the apparent opposites, combine to produce the boundary and the effects that are visible. So the boundary that is created by these opposites create the authentic constraints under which the system operates. 3. By tweaking the values of the authentic constraints the quality of the system changes. For instance it becomes clear that bigger the gap between ‘acceleration’ and ‘deceleration’ more would be the number of traffic jams with longer lengths that extend backwards (both frequency and amplitude of the jams increase). For certain ratios of acceleration and deceleration the jams minimizes or maximizes (I have not shown those ratios here to keep the post to a manageable size). However it is interesting to note that as we increase the minimum group velocity the incidences of jam reduces and so does the length of jams. When that happens the quasi-periodic nature of the event suddenly transforms to that of a periodic nature. That is what determines the group behavior or the ‘collective intelligence’ (the B wave). So far so good. But how do we use this insight of ‘raising the minimum group velocity’ for practical applications in different fields? Let us explore. The same happens for a Blast Furnace of a Steel Works. Whether the furnace would ‘hang’ or ‘slip’ (big problems for Blast Furnace) worries both Blast Furnace engineers and management alike. With this insight when I looked at the phenomenon I saw the same pattern of jamming followed by sudden opening up. The system is caught by a Torus attractor characterized by a quasi periodic movement. And the most surprising thing I noticed was that when deceleration was high the undesirable event continued for longer duration. And this was specifically induced when the blast temperature was below a certain limit. There is more to this which I may be blogging about later. But as of now we seem to have cracked a century old unsolved problem opening up a way to predict and take appropriate actions as to when the Blast Furnace would ‘hang’ or ‘slip’. Production shops are designed for ‘flow’. But as is often the case, we see material (finished as well as work in progress) jamming up the shop floor, which signals the most important source of productivity and profitability problems. So far, managers have tried many methods. But every technique seem to work for some time and then suddenly stops giving results. Why is that? This is because manufacturing units often operate under ‘dancing landscape’. Now ‘dancing landscape’ is a term used in complexity science which means that the system is operating in an uncertain environment. How is that? Most business units operate in uncertain conditions. Orders vary, customers vary, the level of service demanded varies, order sizes vary, logistics vary etc. But the system that is designed to offer goods and services often remain invariant. So naturally the system and its operating environment quickly goes out of ‘sync’ and trouble ensues. However the insight gained from Traffic flow might help. The simple idea would be to increase the average speed of the manufacturing unit and not to concentrate specifically on any particular point, station or unit. Increasing the group velocity is the determining factor in design and operation of a business unit keeping in ‘sync’ with the operating environment. As of now the improvement ideas have revolved around increasing the velocity of the slowest unit, not the group as a whole. Well managers might now think differently. C) Flood, Stock Market, Education, Economic Health. I am putting all of these issues together since the basic nature of these seemingly unrelated systems is exactly the same. Can we predict floods much in advance so that we can save lives in a more effective manner? We presently do it by measuring the rise of water level. But what happens if we measure the velocity of a river at different points along its length in order to detect a significant change in the deceleration component enabling us to predict a flood much in advance to save valuable lives? I believe it would be possible to do so. Similarly, no one has got the prediction of stock markets right. That is what appears to be the case till date. We gather trends in different ways. We trend the rise or fall of stock indices. We trend the rise and fall of the major stocks. We do all that in order to predict, which at its best is at times awfully off the mark. What we might do instead (only a suggestion) is to trend the acceleration and deceleration of the various market indices to predict better. I believe this would be useful. How do we know how well a class or a school is doing? Noticing the highest and the minimum scores might be a way. Measuring percentile scores might yet be another way. I am sure most schools employ some sort of ranking measures and scores to keep tab on their effectiveness of teaching and growth in the capability of students. But what happens if we choose to consider trending the ‘acceleration’ and ‘deceleration’ of such scores over a period of time (since education is also a dynamic process)? May be we would have a better understanding of how the students are faring and how well the school is doing. I believe this would provide a useful understanding in the field of education. The same insight might be applicable to Economic forecasts and predictions as well. Presently we measure the strength of an economy by measuring its GDP, PPP, growth rates etc. What might happen if along with the usual measures we measure the ‘acceleration’ and ‘deceleration’ of the economy. My guess is that it would reveal the presence of the same Torus attractor, which would not only help us to predict which way the economy is going but also help us understand better the actions needed to make necessary improvements. This too I believe would be very effective. However, it is fair to say that though I have personally experienced how this insight helped me improve Engineering, Production and Organizational systems I haven’t yet applied the insight to other potential fields I highlighted like Flood Management, Stock Market predictions, Educational effectiveness and Economic health. But I believe that it would work just as successfully as it worked in engineering, production and manufacturing systems. What gives me this confidence? Simply because the pattern these systems generate would be just the same since they would all be governed by the same type of attractor, ie. the Torus attractor. 3. Tube is taken as a topological shape (a very common shape) where action takes place through independent actors (drivers in this case) which distorts or de-shapes the tube over time through a dynamic process. a) Fixed attractor – think of a damped oscillation, It tries to settle at one point only. Example: A married man falls in love with a lady who is not his wife. His mind is occupied 24×7 with this new lady. Nothing on earth can buzz him off the fixed point. He is hell bent on bedding this lady. b) Oscillating Attractor: I call this a ‘sync’ attractor — an attractor which brings in harmony. It is a periodic wave like a sine wave or a cos wave. It is something similar to – get up in the morning, go to office, come back from office, have dinner, do facebook, go to bed, make love … and this continues day after day.. So periodic. Or it is like a woman’s menstrual period. c) Torus attractor — the characteristic is ”quasi periodicity”. Simple idea — I like to take holidays two times a year. But it is not very periodic. In the first year it is in July and December. In the next year it is in June and Nov. Third year it is in May and October. Note the quasi periodicity . Appears random but it retains the frequency of twice a year. d) Strange Attractor – Now we don’t know what exactly might happen. Such an attractor is unusual and appears all of a sudden or is not anticipated by us. Hence the term ‘strange’. Examples – heart attack, epilepsy, etc. 5. I chose the screen shots from my experiment to depict two things — 1) the saw tooth wave (the red graph) and how the group velocity of the cars changes while moving within the constraints defined by the upper and lower limit of group velocity determined by the acceleration and deceleration of the cars. Notice how the red graph varied as I changed the acceleration and deceleration of the group thus affecting the group dynamics. Its simply a revolutionary post. While the models of systems thinking/dynamics gives us a fair understanding of complex systems & situations at a particular time, they often fail to explain how things move/flow over time and how they would behave over a wider time interval. Hence we often fail to understand and manage strange behaviours of complex systems viz city traffic, power grid etc. This approach seems to have a much wider & deeper potential in appreaciating and solving complex issues of human life with its unique capability to explain behaviours of extremely dynamic complex systems over a significant time period. I am particularly overwhelmed by your success in cracking the notorious problem of blast furnace hanging. I somehow have a gut feeling that bigger is the problem, better is the usability of this approach. Perhaps this can also help us to understand global issues like international politics,war,terrorism. You have indeed made invaluable contribution to the problem solvers community thru this post. Thank you for your very thoughtful and deep observations. You are right. Existing theories fail to deal with movements. They usually present static picture of a situation at a given point of time backed only by their perceptions. It is much better to see the movements as it is. The existing theories also are unable to explain how a system moves from one attractor to another. Without understanding these two basic characteristics of any dynamic system (I prefer to call them dynamic non-linear processes, which are creative) I cant understand how our present problems (especially big and wicked ones) can ever be solved.